Qualicare remains dedicated to keeping our shareholders and members up-to-date with the latest information affecting medical practice. As such this edition is dedicated to the recently updated Medicines and Related substances Act 101 of 1965, which was published on the 15 March 2016 . 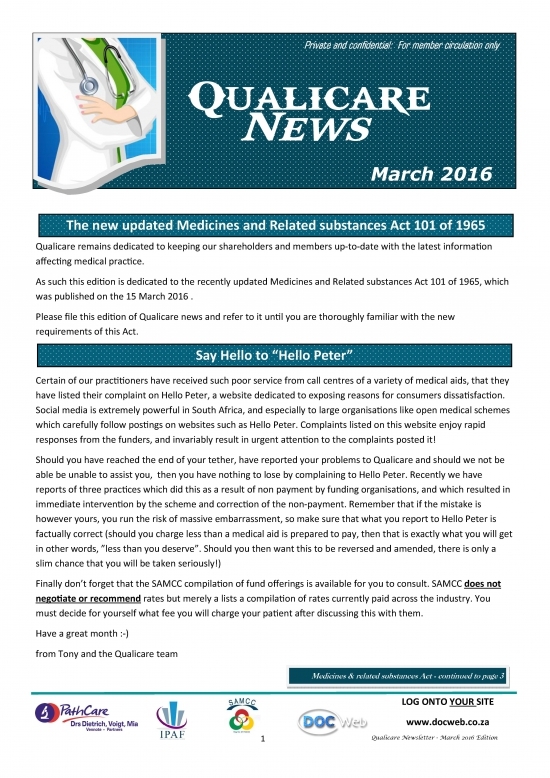 Please file this edition of Qualicare news and refer to it until you are thoroughly familiar with the new requirements of this Act. Certain of our practitioners have received such poor service from call centres of a variety of medical aids, that they have listed their complaint on Hello Peter, a website dedicated to exposing reasons for consumers dissatisfaction. Social media is extremely powerful in South Africa, and especially to large organisations like open medical schemes which carefully follow postings on websites such as Hello Peter. Complaints listed on this website enjoy rapid responses from the funders, and invariably result in urgent attention to the complaints posted it! Finally don't forget that the SAMCC compilation of fund offerings is available for you to consult. SAMCC doesnot negotiateorrecommend rates but merely a lists a compilation of rates currently paid across the industry. You must decide for yourself what fee you will charge your patient after discussing this with them.